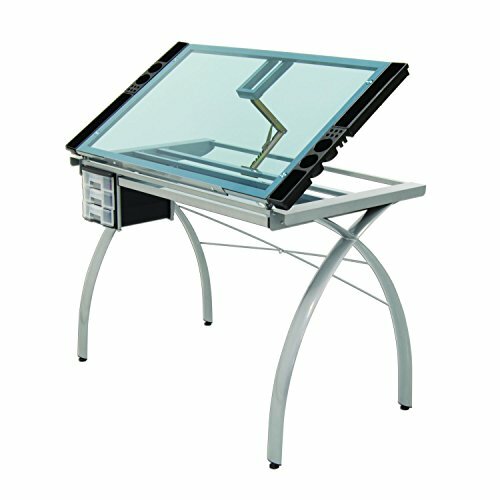 The perfect multi-functional contemporary table: studio designs' Futura craft station is great for drafting, drawing, or crafting on its large tempered safety-glass work surface. The table top angle adjusts up to 35 degrees. Features include a large pencil drawer, 4 removable side trays for supplies, and 3 slide-out drawers for additional storage (mounts on either side of the table). A 24" pencil ledge slides up and locks into place if you'd rather keep pens, pencils, or brushes on the table top. Constructed of heavy gauge, powder-coated steel for durability and 4 floor levelers for stability. Available styles: silver/blue glass, black/black, black/white, black/clear glass. Main work surface: 38" w x 24" d. Pencil drawer dimensions: 28" w x 9.5" D. Overall dimensions: 43.25" W x 24" d x 31.5" H. (Additional item accessory sold separately: Futura leg extensions in silver #10051 and black #10073).